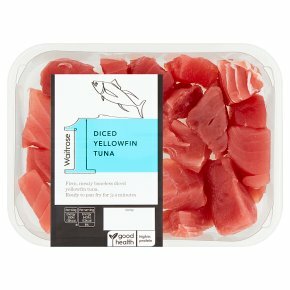 INGREDIENTS: yellowfin tuna (Thunnus albacares) (fish). Pan Fry. Medium Heat. Time: 3-4 minutes. Remove all packaging. Heat a knob of unsalted butter and 1 tablespoon olive oil in a large frying pan. When foaming add the diced tuna. Pan fry over a medium hot heat, turning occasionally to ensure tuna is evenly coloured on all sides. Do not reheat once cooled. Size and thickness of fish may vary, cook times are given as guidance. Wash hands, all surfaces and utensils after touching raw fish.